He's been at work in the Sacramento area - perhaps my Sacto readers could keep an eye out and report back. The radio bit said he was headed to the Bay Area today for more truth-in-signage work. During the segment, in which a reporter rode with him while he posted signs and negotiated his way out of a ticket or other formal police reprimand, the FB likened himself to a great literary figure (though not the one by which he signs his emails). The figure? Don Quixote. Perhaps not the Best analogy ever - but the FB says that the Don lived in a beautiful world. True, I suppose. (For a better treatment of Don Q with the war in Iraq, etc, see this article). I must admit, while listening to the piece I was cataloguing some of the better overpasses I've seen around here. My advice - drive the 280 (280, for you Northern Californians) - there's some choice fencing there just waiting to be adorned. I also wondered, however, if the signs won't be preaching to the choir in these parts. The messages are valuable nonetheless, but what about inland? Far North? What about swing states (through many of which Phoblog will be driving in a few days time)? Yes, I thought about where I could acquire enough poster board and bungee cording prior to my departure - surely Ohio has overpasses. But with technical difficulties plaguing my access to various jurisdictions laws on such activities, it may not be the wisest endeavor. Or maybe it would be the most important. 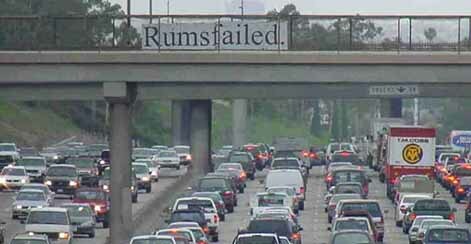 We wish you well, Freewayblogger, may your font stay true and your overpasses be plentiful.